Gustav Larsson won the final stage of this year’s Giro d’Italia, bringing the curtain down on one of the most spectacular Grand Tours of the last decade. The 15.3 kilometre individual time trial was, in the end, a straightforward stage as it altered the general classification very little. Larsson, an accomplished time trialler who is often overshadowed by his Saxo Bank team mate Fabian Cancellara, took the first win of his season outside Verona’s spectacular Piazza Bra Arena. “I am very happy to win a stage, and I hope it’s not my last big win,” Larsson said. The spectators crammed in to the Arena will however remember the day for Ivan Basso’s overall win. The Liquigas leader rode cautiously in to Verona, knowing that his 1-15 minute advantage over Spaniard David Arroyo was never going to be seriously challenged. Perhaps with Denis Menchov’s crash in last year’s final TT in his memory, Basso took the corners gingerly to safeguard his second Grio win. A popular win in Italy, his fans will be hopeful that this victory wont be put in the shade by a future doping investigation as his 2006 win was. Four years ago Basso romped to what was a barely believable win before being banned for two years for his involvement in Operacion Puerto. This year he ground out a narrow winning margin over three week’s of epic racing. Behind him there were some minor battle for GC placings. Basso’s Liquigas team mate Vincenzo Nibali held on to third place by beating Michele Scarponi, but there was no such luck for Australian sensation Richie Porte. Porte, a first year professional was one of the animators of this year’s race, lost his sixth place to Alexandre Vinkourov. HTC Columbia’s Marco Pinotti finished second today, doing enough to over-haul Robert Kiserlovski in ninth place. Briton Bradley Wiggins eventually finished seventh. The Brit had taken it easy over the last two days to focus on today’s short stage, but he was unable to bookend his race with two wins. 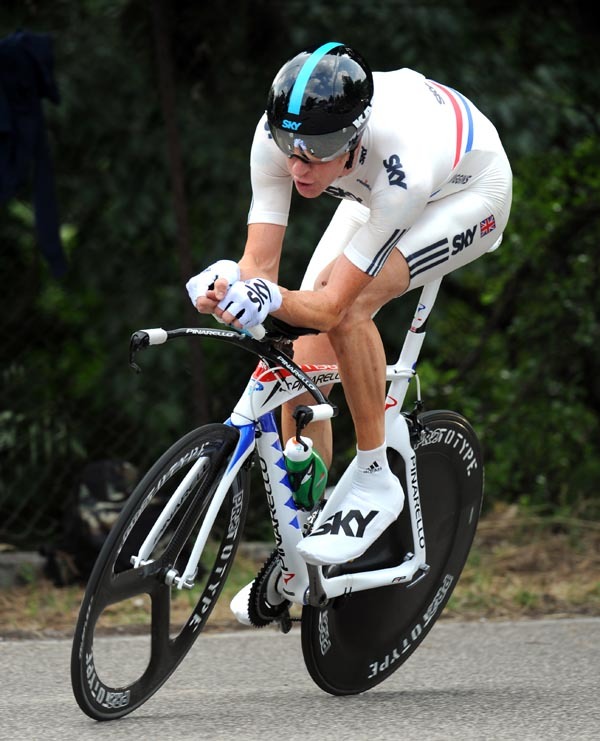 Seventh for British TT champ Bradley Wiggins. Next stop the Tour de France!